The chapter considers how the university sector as a key stakeholder in the promotion of an inclusive physical culture can contribute to the development of disability (including para) sport. It focuses on two perspectives. The first considers universities as not just centres for knowledge production but also as focal points for promoting a critical pedagogy, forming the basis for developing disability sports coaches, scientists and administrators as critically reflective practitioners. The second relates to ways in which university portfolios can contribute to disabled athlete development through, for example, expanding the disability sport coaching base, adaptive strength and conditioning programmes, supporting the work of federations and engagement with research and development. 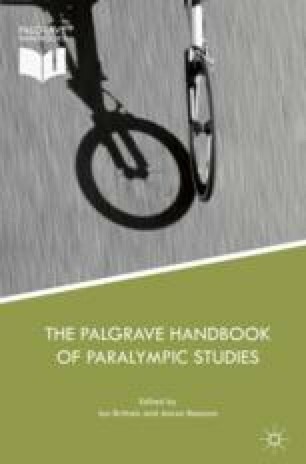 The chapter closes by arguing that if universities are to serve the public good locally, regionally and globally, challenging neoliberal individualism at an institutional level and sharing information and expertise across the sector is necessary to provide the basis for a more accessible disability sport environment. BUCS. 2011. Into Inclusion: A Disability Sports Strategy for BUCS 2011–2016. http://c1593.r93.cf3.rackcdn.com/Into_inclusion_-_BUCS_Disability_Strategy.pdf. Accessed 8 November 2014. ———. 2012. Olympic and Paralympic Games: The Impact of Universities. http://www.universitiesuk.ac.uk/policy-and-analysis/reports/Documents/2012/olympic-and-paralympic-games-the-impact-of-universities.pdf. Accessed 12 November 2014. ———. n.d.-a. Disability Sport in Higher Education. http://www.bucs.org.uk/page.asp?section=18492&sectionTitle=Disability+Sport+Advice+%26+Guidance. Accessed 20 October 2016. ———. n.d.-b. Greenbank: From Foundation to Fruition. http://bucs.org.uk/core/core_picker/download.asp?id=26090&filetitle=Inclusive+Sport+-Greenbank+Foundation+to+Fruition. Accessed 12 September 2016. Complete University Guide. 2013. http://www.thecompleteuniversityguideco.uk/universities/sports/sporting-excellence/. Accessed 15 November 2014. English Institute for Sport. n.d. Home Page. http://www.eis2win.co.uk/Pages/default.aspx. Accessed 12 November 2014. Gov.uk. n.d. Check If a University or College Is Officially Recognised. https://www.gov.uk/check-a-university-is-officially-recognised/listed-bodies. Accessed 12 October 2016. IPC. 2010. Women in Sport Leadership Toolkit: Increasing Opportunities for Women in Paralympic Sport. http://www.paralympic.org/sites/default/files/document/130130154714620_2010_10_01++ipc+women+in+sport+leadership+toolkit.pdf. Accessed 13 November 2014. ———. n.d. What We Do: Research at IPC Events and Games. https://www.paralympic.org/the-ipc/science/research-at-events. Accessed 11 January 2017. Peter Harrison Centre. 2012. The Final Push to London 2012. Newsletter Issue 10 Winter 2011/2012. http://www2.mmu.ac.uk/media/mmuacuk/content/documents/rke/E%20-%20Peter%20Harrison%20Centre%20Newsletter_Winter2011-12.pdf. Accessed 11 November 2014. Talented Athlete Scholarship Scheme. 2009. Deloitte Recognised for Support of TASS. https://www.tass.gov.uk/news/2009/7/deloitte-recognised-for-support-of-tass.html. Accessed 12 November 2014. ———. 2016. Rio Paralympics, September. https://www.tass.gov.uk/news/2016/9/rio-paralympics-2016. Accessed 15 October 2016. ———. n.d. Talented Athlete Scholarship Scheme: Helping Talent Shine in Education and Sport. https://www.tass.gov.uk. Accessed 10 January 2016. UK Sport. n.d. Talent Identification and Development. https://www.uksport.gov.uk/pages/talent-id. Accessed 11 November 2014. University of Durham. 2015. Paralympics GB Sports Fest. https://www.dur.ac.uk/experiencedurham/events/?eventno=23158. Accessed 5 March 2016. University of Worcester. 2012. Country’s First Disability Sport Degree Launched in Run-up to 2012 Paralympic Games. http://www.worcester.ac.uk/discover/countrys-first-disability-sport-degree-launched-in-run-up-to-2012-paralympic-games.html. Accessed 23 June 2016. ———. 2013. University of Worcester Arena to Play Host to Paralympic Celebration. http://worcester.ac.uk/discover/university-of-worcester-arena-to-play-host-to-paralympic-celebration.html. Accessed 11 November 2014.